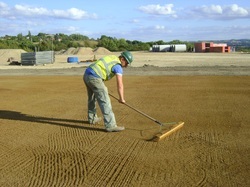 We have been involved in the Design and Construction of cricket squares and outfields for a number of years. We have constructed school standard, club standard and have also built some county cricket standard wickets and practice wickets. 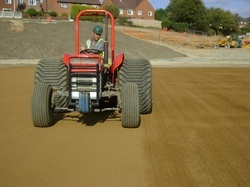 We are happy to be involved in the initial planning of any new wicket and advise as to which type of square and cricket loam would be most suitable. We can also source independent expert advice if required. The key to a good square is that it should be level along the line of play and that the surface should be firm to provide consistent bounce and pace. 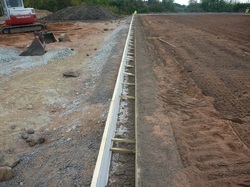 The initial base work sets the level for the finished surface. This ensures the layers above weather gravels or crickets loams are all even. This is to makes sure the square is uniform in it's characteristics. 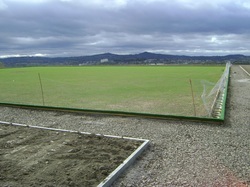 A perimeter drain is considered a bare minimum for any new square as it helps the it shed excess water in early spring. 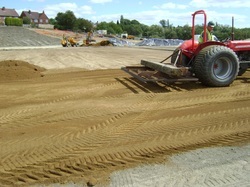 Here, the base is being prepared to receive the cricket loam. We like to ameliorate the base layer with the proposed cricket loam so as to reduce the risk of the clay breaking away from the base. The cricket loam is installed. It is vital this is done in even layers to get even consolidation of the clay. 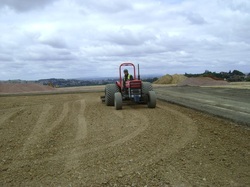 Once the clay is in, the surface can be laser levelled. The square is seeded with Bar Extreme which is hard wearing blend of dwarf rye grasses suitable for cricket. 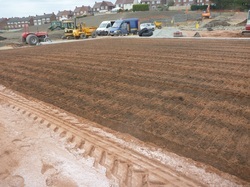 When the cricket square has been seeded with the drill the finishing touches are put in by hand. 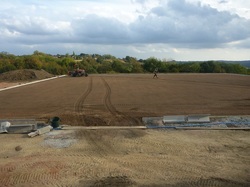 The cricket square has germinated and is ready for it's first cut. There are two types of Bowling Green a Flat Green or Crown Green. The basic construction is similar both require a smooth and uniform bowling surface. Most greens are constructed with a gravel carpet for drainage with a perimeter drain leading to an outfall. Whether it is a Crown or Flat green it is imperative the layers of the construction materials are built up evenly to ensure the green has uniform characteristics in the way it plays, drains and grows. 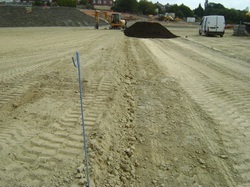 The formation is carefully graded to ensure the following construction layers of gravel and rootzone have uniform depths. 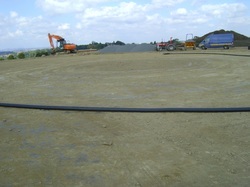 Perimeter drains installed and grade installed with laser. 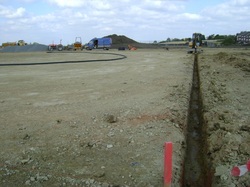 Specialist channels installed using GRC units. 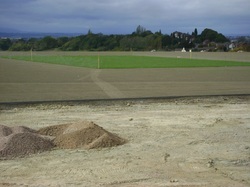 On this particular site the indigenous topsoil was tested and found to be good quality. 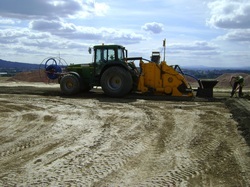 To improve it's drainage potential 75mm of Medium fine sand was ameliorated into the soil profile. 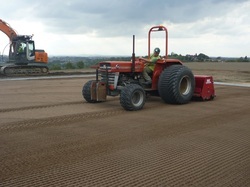 Seeding with Barenburgs Bar 2 which is a fine turf mix of creeping red fescues and bents.